You invite your friends over one night and you decide to get a little tipsy with some red wine you’ve been saving. As you go to enjoy a second cup, you accidentally knock the entire bottle onto your new white carpeting. Here’s another scenario: you just got a new Goldendoodle puppy — she’s the cutest — when she has an accident on your new navy carpeting. These situations are exceptionally common and happen to everyone. However, it’s how you deal with the situation that makes all of the difference. Maybe you think that blotting it out with water will do the trick or grabbing bleach really quickly will wash away the issue, but that’s not always the case. 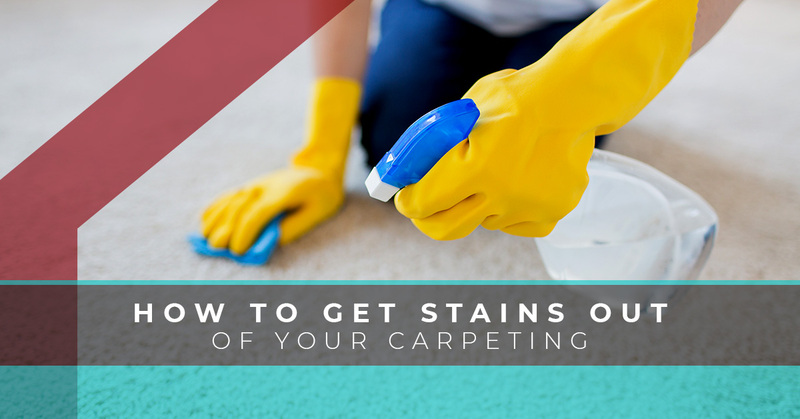 In today’s blog, we’ll be digging into the realm of getting stains out of your carpet. It’s important that you know how to get these stains out since it can be incredibly disheartening to see your new flooring get ruined because of an accident. Don’t let your carpeting suffer because you’re not sure how to remove a stain. If you’re in the market for some new carpet, then don’t hesitate to contact us for a carpet installation. Stains come in many different types. Sure, they may all be a nuisance, but it’s the base of the material that’s spilled is what determines how you should deal with it. The way you’d deal with a red wine stain is different than how you’d deal with some milk or even a water stain. Each material that could possible spill has a different soluble, which makes it different to clean. If you get blood on your carpet, you’ll need to do a little extra than if you get washable ink. We laid out the different types of stains and how you can deal with them below. Before you start to remove the stain on your carpeting, we strongly recommend blotting the area dry. Once it’s dry, you’ll want to rinse thoroughly with water and then blot the area again. You don’t want to scrub the carpet because you could ruin the carpet fibers or you could further let the stain soak, which can be almost impossible to remove. Treat the area gently, so you don’t do more damage. We hope these tips have helped you have beautiful carpeting, even if something does spill. If you’d like to get new carpeting, then feel free to contact Danbury’s Top Rated Local® Flooring company.